Thanks to everyone who has been a loyal reader of the blog over the last five years. After some consideration, we've realized that we're just not generating enough content here to warrant your time, so we won't be posting here any longer. 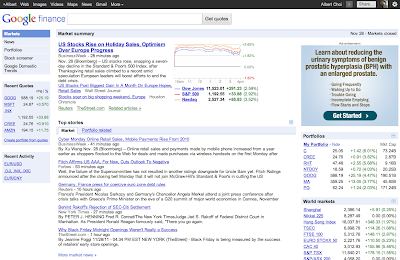 Instead, we'll start contributing to the Inside Search blog, so tune in there for updates on Google Finance. Today we’re excited to announce that we’re adding data from the Nasdaq Nordic and Baltic exchanges and the Moscow Exchange to Google Finance. These additions greatly expand our coverage in Europe. For the first time, you can view the primary listings of Gazprom, H&M, Nokia, Carlsberg, and many others on Google Finance. Even better, all these exchanges will be available in real time, furthering our mission of bringing you real time market data from around the world. As always, you can view the full list of the stock exchanges available through Google Finance on our Disclaimer page. There are two things that made this an exciting project for me. First, what started out as an idea in the mind of one Googler became a live feature in a product used by millions of people every day. And second, the launch of this feature in April 2010 marked the first time that individual investors could freely access this kind of information in conjunction with financial data. 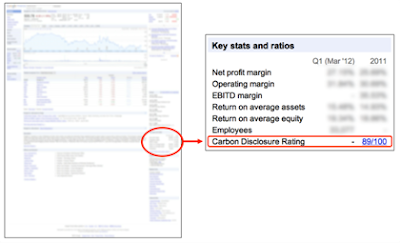 Why would investors be interested in a company’s carbon disclosure rating? We thought it would be useful because a company’s emissions, as well as climate change more generally, can pose financial risks -- and investors generally like to understand such risks. These risks can take several forms: from regulatory risks (e.g. legislation placing costs on carbon-intensive activities) to physical risks (e.g. sea-level rise threatening a company’s facilities) to market risks (e.g. consumers switching to another company’s products because they believe that company to be a better environmental steward). All of these factors (and others) go into CDP’s calculation of a company’s carbon score, so it can be a useful metric for investors. As I begin my sixth year at Google, I’m excited that we’re making environmental information more universally accessible and useful, and I’m looking forward to the projects and challenges ahead. Here at Google, we get excited by bringing our users relevant information at blazing speeds. So, why would we want to make users wait 15 minutes to see what trades are being made? As always, though, we won’t just rest on these laurels. We’re eyeing more opportunities down the road, and are eager to bring you more information, so check back soon. Since we launched Google Finance in 2006, we’ve been excited about providing our users with the tools to monitor market changes, manage their portfolios, and make better investment decisions. And today, we’re excited to bring you real time quotes from the London Stock Exchange (LON), Deutsche Börse (FRA), and Borsa Italiana (BIT) to better track economic and financial developments in Europe. We first introduced real time quotes to our site with the launch of free real time NYSE and NASDAQ quotes in 2008. Since then, we’ve bolstered our last sale coverage with real time data from stock exchanges in China, India, and now, UK, Germany, and Italy. These partnerships mark a big step forward in our mission to provide our users with the best information we can find. So, go ahead -- keep an eye out for Adidas, compare Barclays to RBS, see how Fiat has performed over time. You can do it all on Google Finance. In real time. Over the last few months, you might have noticed that Google products have been getting a new look. 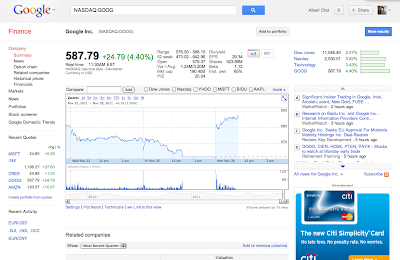 And starting today, Google Finance is joining the party! This means that over the next few days, you’ll begin to see a new look in Finance that brings you a more consistent and seamless experience with the other Google products you use. While the most recent changes focus on the visual design, keep your eyes peeled for improvements to the navigation and functionality of Google Finance in the near future. If you’d like to share your thoughts on the changes, feel free to voice your opinions on our feedback form. We’re always striving to improve your online experience, and your suggestions are really helpful in moving our product forward. 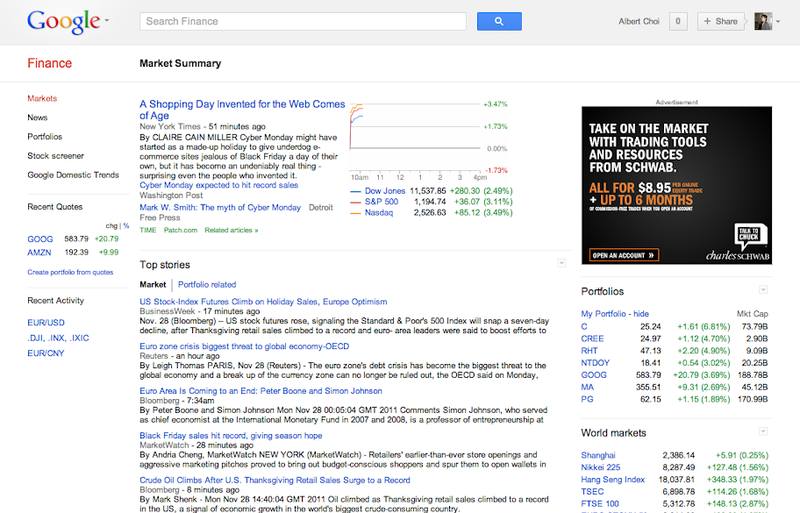 Google Finance celebrates its fifth birthday today. We thought this would be a great opportunity to look back on the last five years and highlight some of the most exciting features we have launched. Google Finance launched on March 21, 2006 with pricing data from the New York Stock Exchange, NASDAQ, Amex and Euronext. Our most innovative feature at the time was the now-familiar interactive chart that seamlessly scrolled, zoomed, and showed a timeline of news coverage for each company. Later that year we added the ability to track your investments in a portfolio. 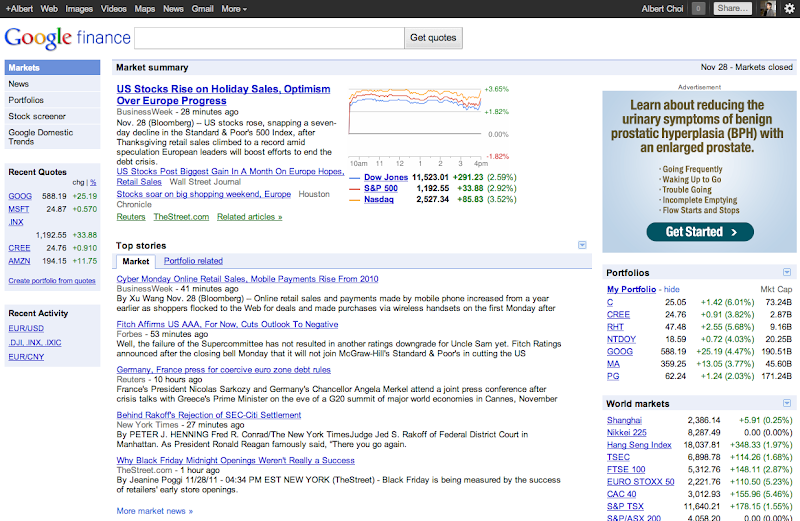 In 2007 we added some major new ways to access Google Finance. We launched our first mobile application and iGoogle gadget. In addition, we added the GoogleFinance functions which allow you to easily incorporate financial information into your Google Spreadsheets. In 2008 the big addition was the Stock Screener. In 2009 we added Google Domestic Trends, which uses search data to track the state of the US economy. Finally, last year we added options data and the ability to chart the performance of your portfolio. Apart from these big launches, we’ve also made countless smaller improvements. Both charts and quotes now automatically update while you’re viewing the page. You can display technical indicators on the chart, view after-hours trading data, and expand the chart across the whole page. You can see information on related companies for all US public companies. And your portfolio now adjusts your holdings for splits and dividends. to non-logged-in users. Since then, we have upgraded all of our data in China and India to real-time. Today, Google Finance continues to deliver timely financial data to users all over the world. Our users rely on us for our stability - Google Finance was one of the few services to stay up during the flash crash on May 6, 2010. As much as you rely on us, we also rely on you. Last year we launched a Product Ideas page, receiving over 5,000 feature ideas. This type of user engagement is what has allowed us to offer you the product we present today. Thank you all for a great five years, and here’s to many more ahead! 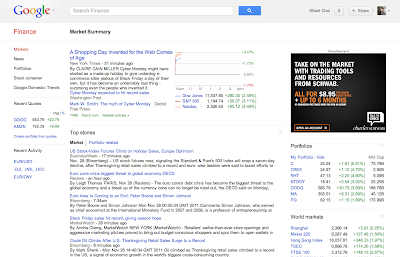 Share: Happy Birthday Google Finance! In July we asked you, our readers, what new features you wanted to see on Google Finance. We received and enthusiastic response with over 3,700 ideas and 38,000 votes. One of the top 10 requests with over 700 votes was a Dictionary function for key financial terms and ratios. We’re happy to announce that we have launched this feature for the financial terms at the top of the company page. To see the definitions, go to a company page on Google Finance and hover your mouse over the financial ratios beside the stock price. You will see a pop-up tooltip for terms such as 52 week, Shares, Vol/ Avg and Div/yield. To see other launches that have come from your feedback visit our Product Ideas blog post . If you’re curious to see all ideas that were submitted, take a look through Google Finance Product Ideas. Google Apps recently launched an improvement that made dozens of exciting Google services available to Google Apps users for the first time. As part of this launch, Google Finance is now available to our Google Apps users for free with their Apps accounts. Google Apps is Google’s suite of cloud-based messaging and collaboration apps used by over 30 million users in small businesses, large enterprises, educational institutions, government agencies, and non-profit organizations around the world. If your organization hasn’t gone Google yet you can learn more about how to lower IT costs and improve productivity and collaboration with Google Apps. For those Finance users who have a Google Apps account, if your administrator has already transitioned your organization to the new infrastructure, you can now use Google Finance by signing in at google.com/finance with your existing Apps account. Share: Welcome, Google Apps users!